Elizabeth Ferris with staff of Centre for Disaster Studies, University of Kerala, and K.S. Bijukumar, US consutate, Chennai. Since 2013 Meridian International Center has been implementing the U.S. Speaker and Specialist Program for India sponsored by the Public Affairs Section of the U.S. Embassy in New Delhi. The program is designed to connect U.S. experts with Indian audiences and institutions; to promote an understanding of U.S. strategic priorities, policies and institutions; and to discuss the political, economic, social, and cultural context from which they arise. One of the most recent U.S. 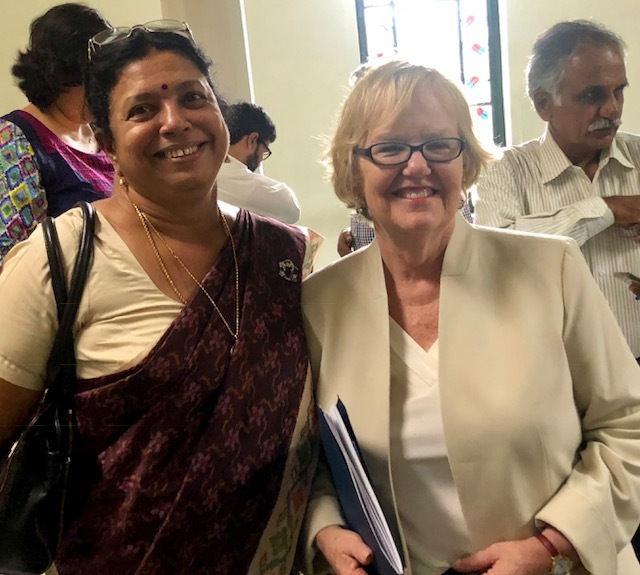 Speakers to travel to India was Elizabeth Ferris, Research Professor at the Institute for the Study of International Migration of the Edmund Walsh School of Foreign Service at Georgetown University, who was selected to participate in the program as an expert on the issue of Refugee Inclusion. The topic is particularly current and relevant as India has seen a large influx of refugee populations from neighboring countries that face issues of internal conflict since its independence – the Partition of 1947, Tibetan refugees, refugees from Bangladesh after the war in 1971, Pakistan, Afghanistan, and Sri Lanka. In this context, South India has absorbed approximately 100,000 Tamil refugees as a result of internal political strife in Sri Lanka. While the Government of India’s official position is to protect and support those refugees who continue to remain in India, local politics have played a large role in whether or not a large influx of foreigners can be recognized as refugees, and whether they can be rehabilitated and integrated into India’s social, cultural, and economic fabric. India is in a delicate position of balancing national security threats with growing human rights concerns in the world. Included below is a blog written by Ms. Ferris at the conclusion of her visit to India which took place in July of this year and included stops in the cities of Trivandrum and Chennai, in Southern India. “When I was offered a chance to travel to India under the auspices of the U.S. Speakers Program, I jumped at the chance. I’ve spent most of the last decade or so working on refugee and migration issues in other parts of the world and hadn’t been to India in a long time. I was asked to give a series of presentations on migration and on refugee inclusion to diverse groups – university students, faculty, government and business officials – as well as a series of press interviews. Everything went according to plan. I spent time in Trivandrum, the capital of Kerala state, and then in Chennai, the capital of Tamil Nadu. The audiences were responsive, the students were engaged, and the logistical details of the trip were flawless. 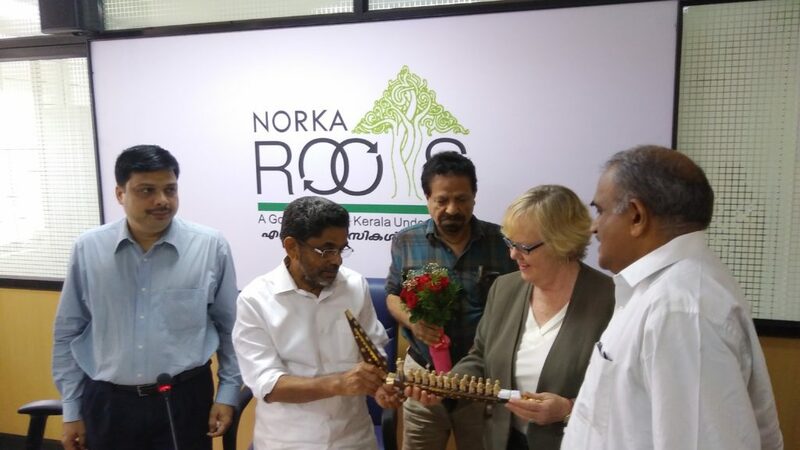 Elizabeth Ferris with government officials at NORKA, Non-Resident Keralites Affairs Department, Trivandrum, India. But a funny thing happened. I learned much more than I taught. Of course, I knew about the large number of migrant workers from Kerala working in the Gulf states, but I hadn’t talked with government officials about their work in supporting these migrants. And I learned a lot from scholars who had spent their careers working on these issues, for example at the Center for Development Studies. I knew about the contributions migrants make to the development of their countries through remittances but it was different talking to the head of the Center for Diaspora Studies in Trivandrum. I was impressed with the many students I met in both Kerala and Tamil Nadu; they were so interested in migration and refugee issues and many are working on Masters and Ph.D. theses on these issues. And I got new insights about the new Global Compacts on Migration and on Refugees that are expected to be adopted by the end of the year and the impact they can have on migrants and their families. I think it was my first trip to India – way back in the 1990s – when I first visited camps for Sri Lankan refugees in Tamil Nadu and met representatives of OfERR, an NGO working with them. The camps – and the refugees — are still there twenty years later, 155,000 of them, according to the UN. And OfERR is still there. 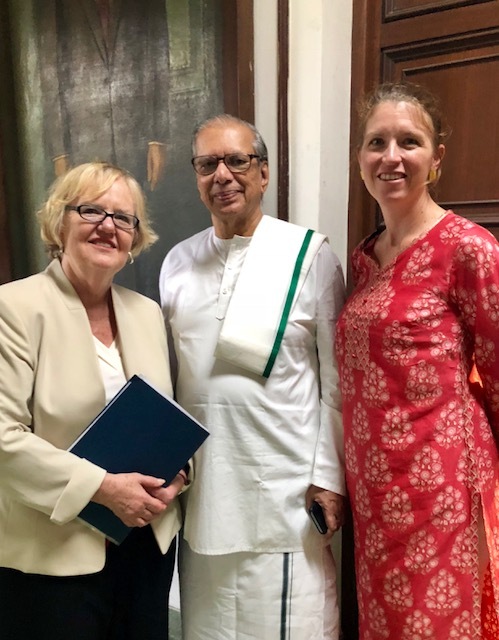 I was delighted to see S.C. Chandrahasan and S. Sooriyakumary – who had welcomed me on my first trip to India – still working at OfERR but now focused on supporting refugees to return. Although I was speaking on global issues, at every presentation I made, someone in the audience asked about U.S. immigration policy – and particularly about the policy of separating children from their families at the U.S. – Mexican border. I tried to explain that while the U.S. has a long and proud tradition of welcoming migrants and refugees, we’re going through a tough time right now when it comes to immigration and refugee policy. I also tried to convey that while I am very critical of the current U.S. administration’s policies toward refugees and migrants, I am glad that I live in a country where ordinary citizens have the freedom to criticize their government’s policies without fear of retribution. And I personally think that it’s good for people in other countries to realize that there are many divergent voices within the U.S. – particularly when it comes to immigration and refugees. There are a lot of misconceptions about the United States – and it was good to be able to talk about some of these. POST TAGS: Exchange, Immigration, India, Meridian Alumni, Meridian Impact, Refugee, Refugee Resettlement.